Clean and Massage Your Hard-To-Reach Places. Made from the same great material that makes the Soapy Soles so effective, The Back Spa Scrubber is a cleaning tool designed to make it easy to scrub your back and any other hard to reach place. This bath accessory will allow you to experience the most invigorating and rewarding shower of your life, and leave feeling totally rejuvenated, and cleaner than ever. Almost 1000 flexible fingers span the length of this scrubber to work up an amazing lather, and allow you to wash your body quickly and easily. 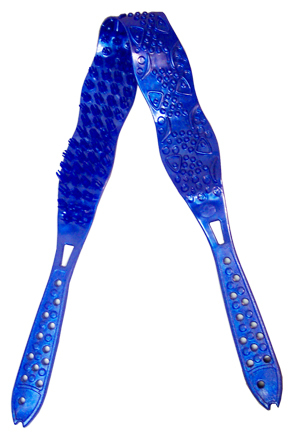 The long design, with ample cleaning surface area ensures that this tool will work great to clean any body size. It's comfortable handles, and soft flexible cleaning bristles allow you to wash your body fast and effectively, while eliminating the need to stretch, bend or strain yourself in the process. Flip the Back Spa over to reveal the bumpy massaging side, and use it to stimulate your body and relax away tensions. 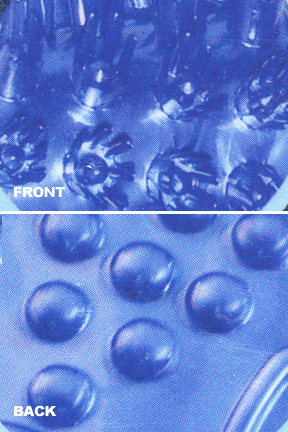 The Back Spa is designed to clean your back, but it is also ideal for any other body part that is difficult to scrub. You can even use it to wash your feet while lying back, relaxing in the tub. 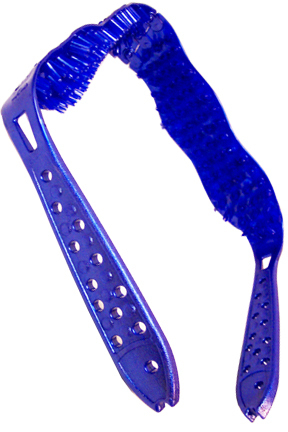 This back and body scrubber would be great for anyone, but it is ideal for those with balance and mobility issues. Lets face it, none of us can adequately clean our backs without using some sort of tool, but many people need a tool to clean anywhere. This is what makes the Back Spa so great. It does an amazing job washing your back, but it is not limited to that use. Easily modify the way you hold it to wash legs, feet, buns, necks, arms and more without bending your body or straining in any way. Most traditional tools can be clumsy or require an unnecessary amount of stretching to achieve good results, but the Back Spa eliminates stretching and reaching, and allows you to keep your arms comfortably in front of you. The soft bristles will feel great on your skin, and have the ability to deep clean your body without being rough or abrasive. The ergonomic handles are comfortable to hold, and feature fun fish-shaped styling for added charm. This back scrubber is designed for massaging and cleaning the back without the need for twisting or turning body movements. The opposite side of the Back Spa offers a spa-like experience as you are able to increase circulation to sore, tired muscles by utilizing the well-placed bumps for a deep massage or a stimulating rub down. Easily reach every inch of your body and get it super clean without stress or strain! COLOR: Pearl blue. Get Yours Today! 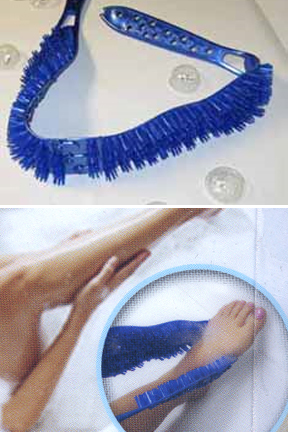 Dimensions (l x w) 41" x 3"
Back Spa Scrubber - Easily scrub your whole body. The back spa makes it easy to wash without bending, stretching or straining. Wash and massage with one great tool. Order Yours Today! I love this scrubber. Feels great, does a great job and dries fast. Just what I wanted.